Bucas Recuptex Therapy Dog Rug is a pleasant dog coat for your beloved pet. This coat stimulates the blood circulation and oxygen supply in your dog's body. In addition, this coat has a good fit and is made of breathing and waterproof recuptex material. Bucas Recuptex Therapy Dog Rug is a pleasant dog coat that stimulates the blood circulation and oxygen supply in the body. This warms your dog's muscles. 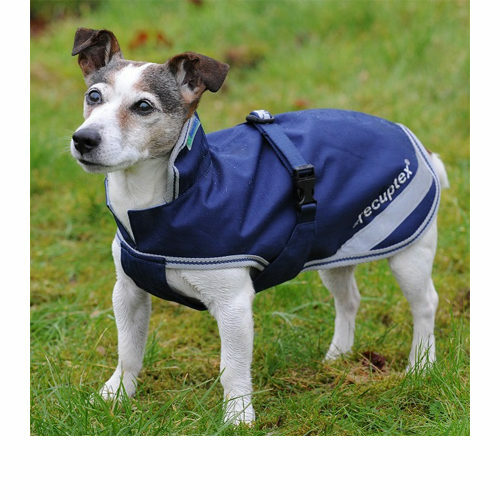 This dog coat is ideal for older dogs or dogs that are extremely active. This coat is made of breathing recuptex material and is waterproof. The reflector strips also make your dog clearly visible in this coat. This coat can be washed in the washing machine at 30 degrees. Bucas Recuptex Therapy Dog Rug is available in ten different sizes. Measure from where the dog's collar would normally be in his neck up to where his tail starts. What if the Bucas Recuptex Therapy Dog Rug does not fit? To check whether the Bucas Recuptex Therapy Dog Rug fits, it may be removed from the packaging and held up next to your pet. This way you can check whether it fits. For hygiene reasons, the coat cannot be returned if it has come into contact with your pet. If we find that the coat is stained, worn, contains animal hair, smells or has been washed after use, we cannot return the product to you. In this event, it will be donated to a charity (local shelter). As we are often confronted with products that are returned in a less than new condition, we have to apply these rules for fitting and/or returning wearable products. Have you used Bucas Recuptex Therapy Dog Rug before? Let us know what you think about this product.